3 Pc. Golden Tiger Sapphire Katana Samurai Sword Set | BUDK.com - Knives & Swords At The Lowest Prices! 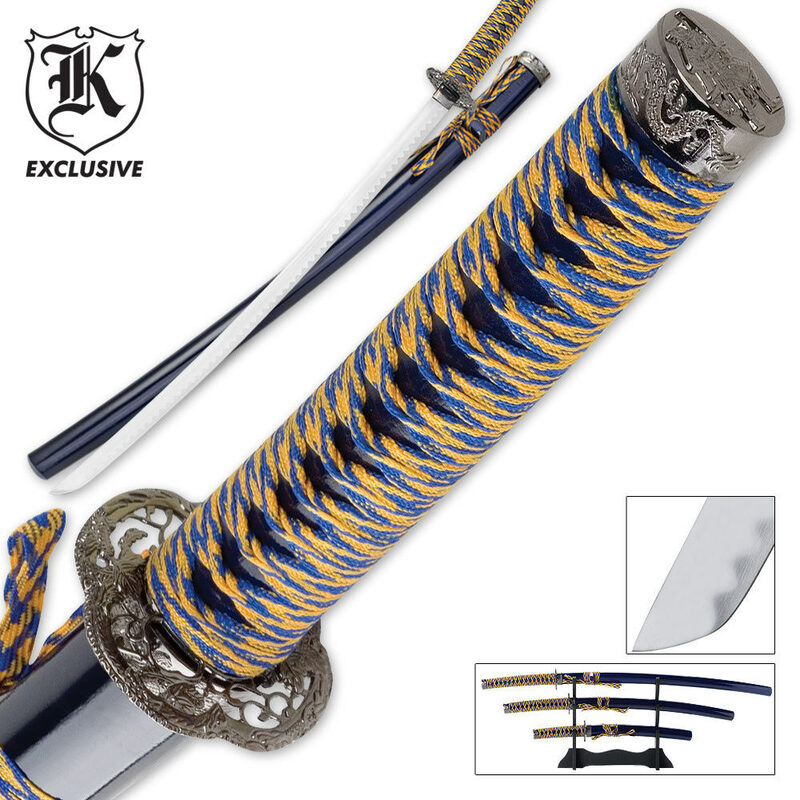 This Golden Tiger Samurai Sword set offers you three distinct Japanese blade design at the cost of just one! 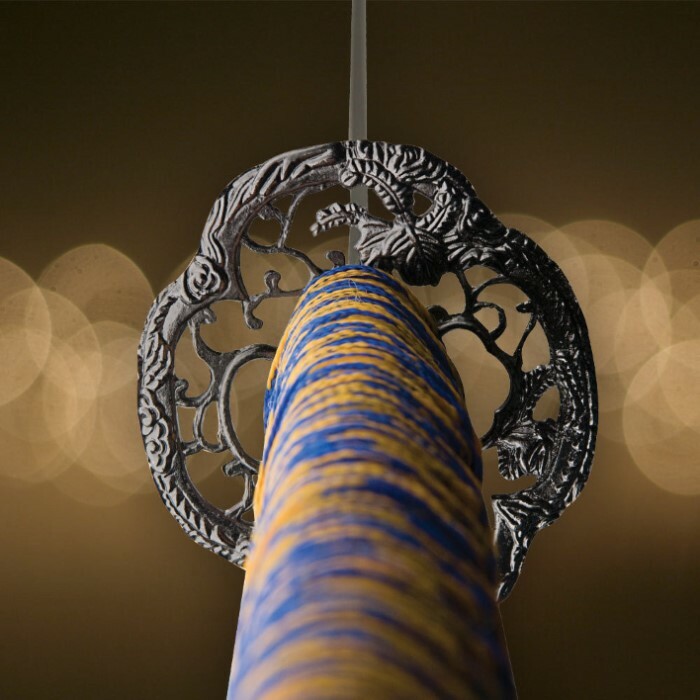 Each sword is equipped with a carbon steel blade with heat-tempered finish. The nylon cord wrapped handles are accented with cast metal tsuba and pommel. The flaming black sheaths are adorned with coordinating cord wrapping. Just got the set in, its ok, it looks good even for a factory made set. The set came in less than a week. They have a great balance for me and look wonderful in my home. I may just order a second set! This is a very nice looking set. it comes with a stand so you don't have to purchase anything additional for it to be placed. The blades are average, but I have no complaint because they are made from carbon steel and not stainless. Yes, these are "dress blades" but can be sharpened and used in a "pinch". However these are not "Battle ready" but they still look great on my mantle! Very nice set if you're looking to make visitors say "wow" when they walk in the room. These are very showy blades and have a very genuine look to them. There Lies the problem though. It only has the look and not the performance. Not sharp at all. Blade bends easily and the blade is wobbly. But as I said, it will look very nice hanging on the wall or setting off to the side. Absolutely get these if you're looking to display because it is a great price, however, if you wanna go out and hack and slash at fruit or bottles or whatever, I would recommend a shinwa blade. Not as showy, but performs great. The reason the blade is wobbly and feels to heavy is that this type of sword generally has a rat tail tang. This makes the blade heavier than the handle. The wobble can be fixed by disassembling the sword, bending and unbending the tang, and then re tightening the nut under the kashira cap.